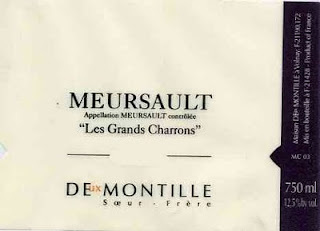 Deux Montille is the Negociant Company created by sister and brother Alix and Etienne de Montille, children of the famous Burgundy producer Hubert de Montille. They now operate the family estates and fairly recently bought a new property, which used to belong to Bouchard. Toping their usual portfolio, they added several other wines now sold under the Deux Montille label. De Montille style remains pure and traditional with tremendous fruit appeal and harmony in each bottle. Following closely in the steps of their father and respectively adding their own twist, character and personality, Alix and Etienne are crafting some of the greatest Burgundies around. The 2005 Meursault “Grand Charrons”, part of this fairly new portfolio, is truly a classic due to the acclaimed vintage but also and primarily because of the quality of the wine. The nose is fresh, expressive and mineral combining orchard fruit aromas with slightly toasted notes and nutty hints. The palate is full and generous, balanced and structured, with classic Meursault weight and creaminess intermingled with stony minerality and refreshing acidity. The lingering finish is quite inviting. A lovely wine to keep for a few years. Decant it to fully appreciate it.